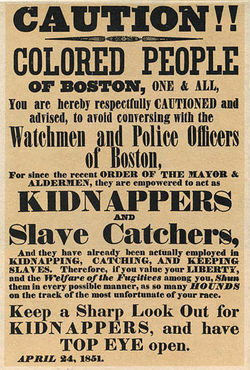 April 24, 1851 "Warning Poster"
What was the Fugitive Slave Act? The Fugitive Slave Law of 1850, commonly referred to as the Fugitive Slave Act of 1850, was one of the five laws that passed in the Compromise of 1850. The Fugitive Slave Law stated that any United States marshal or official who did not arrest an alleged runaway slave was liable to a fine of $1,000. Law-enforcement officials had a duty to arrest anyone suspected of being a runaway slave, based solely on a claimant's sworn testimony of ownership. The suspected slave could not ask for a jury trial or testify on his or her own behalf. In addition, any person who aided a runaway slave by providing food or shelter was subject to six months' imprisonment and a $1,000 fine. Officers who captured a fugitive slave were entitled to a fee. Of the five bills that comprised the Compromise of 1850, the Fugitive Slave Act was the most controversial. The Fugitive Slave Act, along with slaveholding rights in Texas, allowed California to enter the union as a free state and prohibited the slave trade in the District of Columbia. This Act was particularly hated by abolitionists and stoked the fire of the Underground Railroad. See also the Compromise of 1850 and the Fugitive Slave Act: The Ramifications. Be it enacted by the Senate and House of Representatives of the United States of America in Congress assembled, That the persons who have been, or may hereafter be, appointed commissioners, in virtue of any act of Congress, by the Circuit Courts of the United States, and Who, in consequence of such appointment, are authorized to exercise the powers that any justice of the peace, or other magistrate of any of the United States, may exercise in respect to offenders for any crime or offense against the United States, by arresting, imprisoning, or bailing the same under and by the virtue of the thirty-third section of the act of the twenty-fourth of September seventeen hundred and eighty-nine, entitled "An Act to establish the judicial courts of the United States" shall be, and are hereby, authorized and required to exercise and discharge all the powers and duties conferred by this act. And be it further enacted, That the Superior Court of each organized Territory of the United States shall have the same power to appoint commissioners to take acknowledgments of bail and affidavits, and to take depositions of witnesses in civil causes, which is now possessed by the Circuit Court of the United States; and all commissioners who shall hereafter be appointed for such purposes by the Superior Court of any organized Territory of the United States, shall possess all the powers, and exercise all the duties, conferred by law upon the commissioners appointed by the Circuit Courts of the United States for similar purposes, and shall moreover exercise and discharge all the powers and duties conferred by this act. And be it further enacted, That the Circuit Courts of the United States shall from time to time enlarge the number of the commissioners, with a view to afford reasonable facilities to reclaim fugitives from labor, and to the prompt discharge of the duties imposed by this act. And be it further enacted, That the commissioners above named shall have concurrent jurisdiction with the judges of the Circuit and District Courts of the United States, in their respective circuits and districts within the several States, and the judges of the Superior Courts of the Territories, severally and collectively, in term-time and vacation; shall grant certificates to such claimants, upon satisfactory proof being made, with authority to take and remove such fugitives from service or labor, under the restrictions herein contained, to the State or Territory from which such persons may have escaped or fled. And be it further enacted, That it shall be the duty of all marshals and deputy marshals to obey and execute all warrants and precepts issued under the provisions of this act, when to them directed; and should any marshal or deputy marshal refuse to receive such warrant, or other process, when tendered, or to use all proper means diligently to execute the same, he shall, on conviction thereof, be fined in the sum of one thousand dollars, to the use of such claimant, on the motion of such claimant, by the Circuit or District Court for the district of such marshal; and after arrest of such fugitive, by such marshal or his deputy, or whilst at any time in his custody under the provisions of this act, should such fugitive escape, whether with or without the assent of such marshal or his deputy, such marshal shall be liable, on his official bond, to be prosecuted for the benefit of such claimant, for the full value of the service or labor of said fugitive in the State, Territory, or District whence he escaped: and the better to enable the said commissioners, when thus appointed, to execute their duties faithfully and efficiently, in conformity with the requirements of the Constitution of the United States and of this act, they are hereby authorized and empowered, within their counties respectively, to appoint, in writing under their hands, any one or more suitable persons, from time to time, to execute all such warrants and other process as may be issued by them in the lawful performance of their respective duties; with authority to such commissioners, or the persons to be appointed by them, to execute process as aforesaid, to summon and call to their aid the bystanders, or posse comitatus of the proper county, when necessary to ensure a faithful observance of the clause of the Constitution referred to, in conformity with the provisions of this act; and all good citizens are hereby commanded to aid and assist in the prompt and efficient execution of this law, whenever their services may be required, as aforesaid, for that purpose; and said warrants shall run, and be executed by said officers, any where in the State within which they are issued. And be it further enacted, That when a person held to service or labor in any State or Territory of the United States, has heretofore or shall hereafter escape into another State or Territory of the United States, the person or persons to whom such service or labor may be due, or his, her, or their agent or attorney, duly authorized, by power of attorney, in writing, acknowledged and certified under the seal of some legal officer or court of the State or Territory in which the same may be executed, may pursue and reclaim such fugitive person, either by procuring a warrant from some one of the courts, judges, or commissioners aforesaid, of the proper circuit, district, or county, for the apprehension of such fugitive from service or labor, or by seizing and arresting such fugitive, where the same can be done without process, and by taking, or causing such person to be taken, forthwith before such court, judge, or commissioner, whose duty it shall be to hear and determine the case of such claimant in a summary manner; and upon satisfactory proof being made, by deposition or affidavit, in writing, to be taken and certified by such court, judge, or commissioner, or by other satisfactory testimony, duly taken and certified by some court, magistrate, justice of the peace, or other legal officer authorized to administer an oath and take depositions under the laws of the State or Territory from which such person owing service or labor may have escaped, with a certificate of such magistracy or other authority, as aforesaid, with the seal of the proper court or officer thereto attached, which seal shall be sufficient to establish the competency of the proof, and with proof, also by affidavit, of the identity of the person whose service or labor is claimed to be due as aforesaid, that the person so arrested does in fact owe service or labor to the person or persons claiming him or her, in the State or Territory from which such fugitive may have escaped as aforesaid, and that said person escaped, to make out and deliver to such claimant, his or her agent or attorney, a certificate setting forth the substantial facts as to the service or labor due from such fugitive to the claimant, and of his or her escape from the State or Territory in which he or she was arrested, with authority to such claimant, or his or her agent or attorney, to use such reasonable force and restraint as may be necessary, under the circumstances of the case, to take and remove such fugitive person back to the State or Territory whence he or she may have escaped as aforesaid. In no trial or hearing under this act shall the testimony of such alleged fugitive be admitted in evidence; and the certificates in this and the first [fourth] section mentioned, shall be conclusive of the right of the person or persons in whose favor granted, to remove such fugitive to the State or Territory from which he escaped, and shall prevent all molestation of such person or persons by any process issued by any court, judge, magistrate, or other person whomsoever. And be it further enacted, That any person who shall knowingly and willingly obstruct, hinder, or prevent such claimant, his agent or attorney, or any person or persons lawfully assisting him, her, or them, from arresting such a fugitive from service or labor, either with or without process as aforesaid, or shall rescue, or attempt to rescue, such fugitive from service or labor, from the custody of such claimant, his or her agent or attorney, or other person or persons lawfully assisting as aforesaid, when so arrested, pursuant to the authority herein given and declared; or shall aid, abet, or assist such person so owing service or labor as aforesaid, directly or indirectly, to escape from such claimant, his agent or attorney, or other person or persons legally authorized as aforesaid; or shall harbor or conceal such fugitive, so as to prevent the discovery and arrest of such person, after notice or knowledge of the fact that such person was a fugitive from service or labor as aforesaid, shall, for either of said offences, be subject to a fine not exceeding one thousand dollars, and imprisonment not exceeding six months, by indictment and conviction before the District Court of the United States for the district in which such offence may have been committed, or before the proper court of criminal jurisdiction, if committed within any one of the organized Territories of the United States; and shall moreover forfeit and pay, by way of civil damages to the party injured by such illegal conduct, the sum of one thousand dollars for each fugitive so lost as aforesaid, to be recovered by action of debt, in any of the District or Territorial Courts aforesaid, within whose jurisdiction the said offence may have been committed. And be it further enacted, That the marshals, their deputies, and the clerks of the said District and Territorial Courts, shall be paid, for their services, the like fees as may be allowed for similar services in other cases; and where such services are rendered exclusively in the arrest, custody, and delivery of the fugitive to the claimant, his or her agent or attorney, or where such supposed fugitive may be discharged out of custody for the want of sufficient proof as aforesaid, then such fees are to be paid in whole by such claimant, his or her agent or attorney; and in all cases where the proceedings are before a commissioner, he shall be entitled to a fee of ten dollars in full for his services in each case, upon the delivery of the said certificate to the claimant, his agent or attorney; or a fee of five dollars in cases where the proof shall not, in the opinion of such commissioner, warrant such certificate and delivery, inclusive of all services incident to such arrest and examination, to be paid, in either case, by the claimant, his or her agent or attorney. The person or persons authorized to execute the process to be issued by such commissioner for the arrest and detention of fugitives from service or labor as aforesaid, shall also be entitled to a fee of five dollars each for each person he or they may arrest, and take before any commissioner as aforesaid, at the instance and request of such claimant, with such other fees as may be deemed reasonable by such commissioner for such other additional services as may be necessarily performed by him or them; such as attending at the examination, keeping the fugitive in custody, and providing him with food and lodging during his detention, and until the final determination of such commissioners; and, in general, for performing such other duties as may be required by such claimant, his or her attorney or agent, or commissioner in the premises, such fees to be made up in conformity with the fees usually charged by the officers of the courts of justice within the proper district or county, as near as may be practicable, and paid by such claimants, their agents or attorneys, whether such supposed fugitives from service or labor be ordered to be delivered to such claimant by the final determination of such commissioner or not. And be it further enacted, That, upon affidavit made by the claimant of such fugitive, his agent or attorney, after such certificate has been issued, that he has reason to apprehend that such fugitive will he rescued by force from his or their possession before he can be taken beyond the limits of the State in which the arrest is made, it shall be the duty of the officer making the arrest to retain such fugitive in his custody, and to remove him to the State whence he fled, and there to deliver him to said claimant, his agent, or attorney. And to this end, the officer aforesaid is hereby authorized and required to employ so many persons as he may deem necessary to overcome such force, and to retain them in his service so long as circumstances may require. The said officer and his assistants, while so employed, to receive the same compensation, and to be allowed the same expenses, as are now allowed by law for transportation of criminals, to be certified by the judge of the district within which the arrest is made, and paid out of the treasury of the United States. And be it further enacted, That when any person held to service or labor in any State or Territory, or in the District of Columbia, shall escape therefrom, the party to whom such service or labor shall be due, his, her, or their agent or attorney, may apply to any court of record therein, or judge thereof in vacation, and make satisfactory proof to such court, or judge in vacation, of the escape aforesaid, and that the person escaping owed service or labor to such party. Whereupon the court shall cause a record to be made of the matters so proved, and also a general description of the person so escaping, with such convenient certainty as may be; and a transcript of such record, authenticated by the attestation of the clerk and of the seal of the said court, being produced in any other State, Territory, or district in which the person so escaping may be found, and being exhibited to any judge, commissioner, or other office, authorized by the law of the United States to cause persons escaping from service or labor to be delivered up, shall be held and taken to be full and conclusive evidence of the fact of escape, and that the service or labor of the person escaping is due to the party in such record mentioned. And upon the production by the said party of other and further evidence if necessary, either oral or by affidavit, in addition to what is contained in the said record of the identity of the person escaping, he or she shall be delivered up to the claimant, And the said court, commissioner, judge, or other person authorized by this act to grant certificates to claimants or fugitives, shall, upon the production of the record and other evidences aforesaid, grant to such claimant a certificate of his right to take any such person identified and proved to be owing service or labor as aforesaid, which certificate shall authorize such claimant to seize or arrest and transport such person to the State or Territory from which he escaped: Provided, That nothing herein contained shall be construed as requiring the production of a transcript of such record as evidence as aforesaid. But in its absence the claim shall be heard and determined upon other satisfactory proofs, competent in law. Sources: U.S. Department of State; Stanley W. Campbell, The Slave Catchers: Enforcement of the Fugitive Slave Law, 1850-1860, 1970; Don E. Fehrenbacher, The Slaveholding Republic : An Account of the United States Government's Relations to Slavery, 2002; John Hope Franklin and Loren Schweninger, Runaway Slaves: Rebels on the Plantation, 1999 Yale Law School: The Avalon Project.